A few years ago three fellow flying club members had an adventure. All three had recently completed their instrument training and went out to fly around together in the clouds. They landed at Hagerstown, Maryland, and then were trapped by fog that closed in around them. A fourth club member ended up driving an hour or two -- each way -- to pick them up and drive them home, leaving the airplane behind until another day. They were henceforth known as "The Hagerstown Trio." I was talking to one of them around that time and he told me that the whole adventure was about "getting your ticket wet." He explained that getting an instrument rating is one thing, but that there's really nothing like the feeling of descending out of the clouds to an airport. That first, real experience of flying in IMC to get somewhere was a positive one, he implied. He then told me that when I finished my instrument rating, we'd have to go out and "get my ticket wet." I needed to go to court in Memphis. Memphis is in the same state as my new home – Knoxville - but Tennessee is a big state. The distance from Knoxville to Memphis is almost as long as the distance from Gaithersburg to Maine. It's a long way, and it's summer in the south, which means convective activity everywhere. I completed my instrument rating last year, but hadn't flown in any clouds in 9 months. With a total of less than two hours of flying time in actual instrument conditions -- all with the comfort of an instructor in the right seat -- I was an IMC virgin. The clouds were scattered to broken over most of the state, with a line of serious storms running Southwest to Northeast across the top of the state to the north of and parallel to my route -- a crimson streak on the radar depictions. With luck, I could get above most of the clouds, dodge the serious stuff, and avoid any serious instrument flying. As long as the clouds remained scattered, I could also cancel IFR if I was in the clear and divert for an early landing. The ceilings were forecast to be more than 2,000 feet, and the winds light. I took off and climbed to 8,000 feet in the Tiger. Although it was in the 90s on the ground, it was about 55 degrees up high, so I was comfortable and enjoyed the beautiful skyscape while listening to music. About a half hour into my flight, I asked ATC -- for the first time -- for a course deviation to go around a cumulus cloud that had shot up many thousands of feet above my altitude. I wasn't the only one -- the frequencies were full of pilots asking for deviations to go around weather. I could see most of the dangerous clouds, and my Garmin 496 with XM weather confirmed a lot of what my eyes were telling me. Both my eyes and the 496 were telling me that the storms to my right were getting closer as I neared Memphis, and there was weather dead ahead. The Stormscope in my panel confirmed what I was seeing with a mess of little red dots to indicate lightning to my right and ahead. ATC gave me my first descent, to 6,000 feet, about 40 minutes out from Memphis. 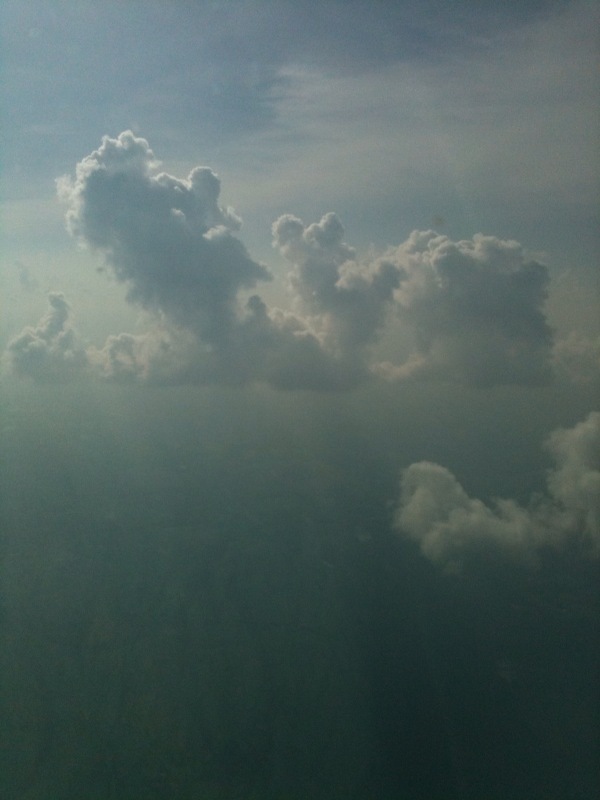 I began popping in and out of some cumulus clouds, with the attendant bumps. Then ATC directed me to descend to 4,000 feet and I was suddenly in the thick of it. I was getting bounced around pretty well. I was in the clouds almost continuously, except for briefest flashes of dizzying sunlight when I would shoot out of one cloud and into the next. Those flashes were becoming more brief and less frequent. The turbulence was getting worse and was well into the "moderate" range. The airplane was getting tossed around and was spending a lot of time on one wing tip or the other. I cinched my seatbelt tighter and was thankful I had had the foresight to use the seatbelt to secure my flight bag on the right seat. After being continuously "on instruments" for perhaps 15 minutes, I was sweating. I could see on my Garmin that there was moderate to heavy precipitation straight ahead. When my weather display updated, it seemed that there were more storms popping up ahead and off my right side, which my Stormscope confirmed. The turbulence was continuous. I felt like I was in over my head, and I wanted OUT of those clouds. I knew that the ceilings around Memphis were around 2,000 feet, which was above the minimum safe altitude, so I called ATC and with a squeaky voice asked for lower. They denied my request and instructed me to fly direct to the Memphis VOR. I had been navigating by GPS and had entered the clouds when I was too far from the Memphis VOR to dial it in. Although I often dial in VORs to provide navigational backup when navigating by GPS, I had been too busy flying the airplane on instruments, in turbulence, to read charts. The loose charts had been tossed by turbulence onto the floor on the other side of the plane and were no longer properly folded to show my location. I'd have to take my eyes off the instruments, lean over, reach down, get the chart, and then try to find the little symbols and letters on it that would tell me the right frequency for the VOR. All while keeping my plane (relatively) straight and level in moderate turbulence and IMC. I had no working autopilot to share the piloting. Then, with a sigh of relief I remembered the "NRST" button on my 496. Nearest -- VOR -- there's MEM -- Enter -- Enter -- Go To -- Enter. That got me on course, and I then dialed in the IFR-approved Apollo GX60 in my panel and both VOR receivers. Something about accomplishing that act -- following ATC instructions, navigating, flying the airplane in bumpy, rainy weather -- something about doing all of that at the same time gave me a jolt of adrenaline and confidence. I thought, "Hell, I can do this!" And I thought of John Peake, my instrument instructor, and Bob Gawler, my DE, and the good bunch of guys that had flown with me as safety pilots during my training, and I thought, "Of course I can do this." I burst out of a cloud into the open. I had been ignoring the music coming through my headset, but in the moment of calm before entering the next cloud, I reached over and grabbed my iPod out of the pocket of my flight bag. With a few clicks, the first beats of Aerosmith's "Just Push Play" pounded through my headset, the first in the playlist titled "Greg's Workout." I looked up at the wall of cloud coming at me at 120 knots, cinched my seatbelt tighter, and I grinned. I loved every moment of the next ten minutes. It got dark -- dark enough that I turned up the cabin lights. (I didn't need them, but I didn't know how much darker it was going to get.) The rain sporadically pounded on the windscreen, and the turbulence took all my attention. Updrafts and downdrafts rocked the plane from one wing to the other, and it was all I could do to keep the plane within 200 feet of my assigned altitude. But I was doing it -- I was riding the beast, in dark, rainy, IMC. My ticket was dripping wet. Flying in "stormy" weather was one thing, but the red blotches, lightning bolts, and storm cells that my Garmin said were straight ahead was another. About ten minutes out from Memphis I broke out of the clouds and could see an airport ahead and to my left. I looked quickly to see what it was and called ATC. "Memphis Approach, Grumman 28244, I'm in the clear and am going to cancel IFR and divert to Olive Branch." There was a new, younger voice on the frequency now. "Grumman 244, you can do that if you want, but I've got a hole in the weather off the approach end of the airport here and I was going to put you right through it. I'm showing clear over Dewitt-Spain [the airport where I was heading]." The phrase that immediately came to mind was "sucker hole." But my GPS had just refreshed the weather display and showed the same thing -- a gap in the serious weather where I could turn northwest and go to my destination. "Okay, I'll take it," I said to ATC. A few seconds later, I re-entered the clouds and a few minutes later, ATC turned me to the northwest and told me to descend to 2,000 feet. The cloud bases were wispy -- solid enough so I couldn't see the ground most of the time, but I could sometimes see horizontally. That's how I saw the lightning. I don't know what caused me to look to my left -- maybe my fascination with the flexing of the wings -- but off to my left a jagged arc of lightning shot across the sky between clouds. It looked like it couldn't have been even one mile away. I gulped and returned my eyes to the instruments. ATC told me to descend to 1,500 feet and I broke out of the clouds at around 1,800. Then I saw my destination airport in the haze. I landed, pulled off the runway, and opened the canopy to the hot, gusty air. I had cinched my seatbelt tighter so many times, it was embedded in my shoulder. This was a trip I couldn't have made without my instrument rating, and it was a huge confidence booster. In fact, although I was dodging thunderstorms and spent a half hour in IMC on my trip home the next day, it was a relative non-event given my new-found confidence in my skills. I filed IFR, took off, and headed north under the Memphis Class B shelf while I called for my clearance. They gave it to me right away and had me climb into the clouds. I was on instruments for maybe 20 minutes while I climbed to 9,000 feet and ATC routed me north to go around some weather to the east. I deviated north and south, with ATC's permission, to go around scattered convective buildups, and descended into IMC for perhaps 10 minutes on my approach into Knoxville. 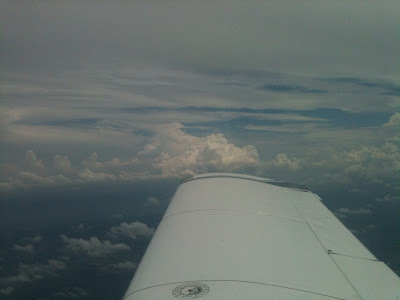 The ceilings were about 2,000 feet, and I cancelled IFR in the air for a visual approach. After arguing in court and eating lunch in Memphis, a time zone away, I was back in my Knoxville office by 3:00. I wish I had had more actual IMC during my instrument training, but I was well prepared. In fact, once I realized that I had all the necessary skills to aviate, navigate, and communicate in weather, it was actually fun. Lots of thanks to everyone who helped me with that rating!